Back in the early 1920’s this crater was considered as a section of the vast Serengeti. This crater is the biggest unbroken volcanic-caldera in the entire world, and the crater itself stretches over an expanse of 259 sq km with its bordering walls towering to about 600 meters. It was created as a result of geological faulting within the eastern part of the Great Rift Valley about 2 to 3 million years back in time. The resultant volcano is assumed to have been bigger than Mountain Kilimanjaro. The sudden removal of molten lava below it resulted into its centre to collapse, hence forming today’s Ngorongoro crater. This name Ngorongoro was derived from ‘llkorongoro’ a local Masai word, used to refer to age group of the traditional Masai warriors that wrested their highlands from the former occupants – the Datong. The Datong had actually got these lands from the Hadzabe who where bushmen, hunters as well as gatherers. The name llkorongoro sounded battle bells to the Masai warriors that occupied these highlands back in the1800. The Masai people further named the walls as well as the floor of this impressive crater, the crater’s walls are refered to as ‘en tiak’ which means ‘steep drop’, whereas the floor is known as the ‘ramat’ which meaning ‘health- land’. Because the Ngorongoro Crater is not a National Park but a conservation area, the Masai are permitted to graze their livestock within this area, and for that reason you can see domestic animals together with wild animals within the crater. Accommodation is usually offered at the edge of the crater, and from there, it’s only a one hour’s drive about the edge of the crater to the place where the road descends to crater floor. You will certainly enjoy breathtaking sights into the crater floor. This area is usually very cold since it lies at a height of 2300 meters and for that reason you are recommended to carry with you warm clothing. The Wildlife within the Ngorongoro Crater presents some of the finest game viewing opportunities better than those you may get in some of the Tanzanian National Parks. The crater supports a profusion of birds as well as animals. The diverse range of habitats offer shelter to about 30,000 to 40,000 animals every year. The crater has swamps, a forest dominated by the yellow-barked acacia trees, as well as Lake Magadi right in its centre, which is a soda lake and commonly visited by numerous flamingoes. The rainy months begin from November until May, while the dry months begin in June until October. The months of June plus July are actually the coldest in the year. The border of the crater is time and again covered in thick cloud. The majority of the animals found in the crater are more like permanent residents here. Among these are several herbivores such as grants Thomson’s gazelles, wildebeests and zebras. However the most singled out animals include hartebeests, cape buffalos, lions, jackals, waterbucks, black rhinos, hippos, elands and elephants. On the other hand, Cheetahs as well as leopards are also present in the crater although they are not commonly seen. 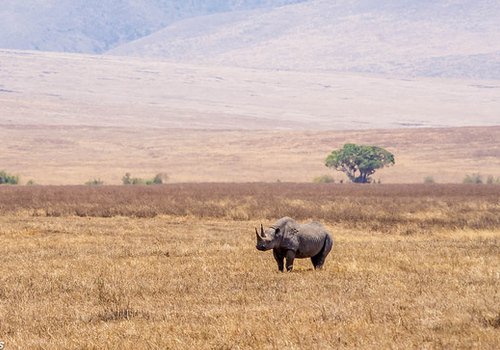 In the whole of East Africa, the Ngorongoro Crater is among the counted places in which you can see the uncommon and yet severely endangered black rhinos. The crater supports a profusion of bird species which live in the diverse habitat it offers in particular the swamps as well as Lake Magadi. Among these are kori bustards, crowned cranes, egrets, geese, flamingos, ostriches, secretary birds, vultures and herons, which are all well represented. Several Millions of years ago, there was a very large volcano nearly the size of Mountain Kilimanjaro stood high towering over the northern highlands of Tanzania. After it erupted, it formed the world’s largest un-flooded caldera – the Ngorongoro Crater. Today this inactive crater is filled with different wild animals and it’s the best place on the African continent where you can enjoy a game drive as well as search for Africa’s ‘Big Five’ animals. The wildlife here is protected by the long 600 meter walls and its in here that you will be able to enjoy vey thrilling game drives. Unique about this wildlife haven is that this is among the very few places in the world where you will be able to see the critically-endangered black rhinos. Other animals commonly sighted on the crater floor include zebras, gazelles, wildebeests, elands, lions, hyenas, wild dogs, and cheetahs. Thousands of pink flamingoes are commonly seen on the shores of Lake Magadi. The Ngorongoro Conservation Area – NCA is a UNESCO World Heritage Site located 180 kilometers west of the town of Arusha between Serengeti National Park and Lake Manyara National Park within the Crater Highlands area. It covers an area of about approximately 8,288 square Kilometers. 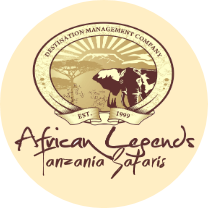 The Conservation Area includes the Ngorongoro Crater, Olduvai Gorge Empakai crater, Ndutu and Mountain Oldonyo Lengai. Another thing unique about the Ngorongoro Conservation Area is that this is the only place in the world where you will see the locals (the maasai people), their cattle and the wildlife co-existing harmoniously within the same habitat. Over 460,000 tourists visit this crater each year making up for almost 60% of the average number of tourists that visit the country every year. Among the famous visitors that have gone to this place is Bill Clinton former President of the USA, Magrethe II Queen of Denmark, Prince William, Rev Jesse Jackson the former American Human Rights Activist, Chris Tucker a renowned Hollywood film star, John Wayne as well as the whole delegation that attended the Leon Sullivan Summit in 2008 which was hosted in Arusha. This crater supports thriving verdant vegetation watered by rainfall, as well as a number of desert plants. There is the lowland uncultivated vegetation, the very dry and semi-dry plant communities, expansive short grass ideal for grazing as well as the highland forests. The steep slopes of the crater wall are covered with dense evergreen forests, while the lower slopes are dominated by dove weeds. The crater floor on the other hand is covered with open short grass plains with water lakes, a couple of Acacia woodland, and swamps. The western plans are dotted with Commiphora Africana trees as well as Umbrella Acacia. The drier areas next to Lake Eyasi are dominated by Zebrawood as well as Blackthorn Acacia, while the extensive grasslands plus bushes support a very large number of wild animals, and they are nearly untouched by human cultivation. Tourist activities within the Ngorongoro Crater are limited only to game drives, plus some nice picnic spots. However, moving out of the crater, there are a number of several different other activities you can enjoy within the park among which are: trekking, walks, cultural visits to the Maasai people and excursions to the Olduvai Gorge. Be part of the exciting game drives conducted on the crater floor during which you will see several different wild animals. There are more than 25,000 large wild animals living within this crater among which are twenty six (26) black rhinoceros, approximately 7,000 wildebeests, approximately 4,000 zebras, approximately 3,000 elands, approximately 3,000 Grant’s & Thomson’s gazelles, the largest lion population in Tanzania, leopards, rare wild dogs, approximately 30 elephants, cheetahs, approximately 4,500 buffalos, mountain reedbucks, spotted hyenas and jackals. Within the Ngorongoro Conservation Area is the Olduvai Gorge an archaeological site, commonly known as the cradle of man-kind and the world’s most significant prehistoric site. It is here that a couple of years ago Dr Louis Leakey together with his wife Mary Leakey Olduvai discovered the remnants of Zinjanthropus, the first humans in the world. It’s within this place that also the remains of the first known human genus specimens – Homo-habilis, and hominids like Paranthropus boisei were discovered. This gorge is a steep-sided windswept narrow valley within the Great Rift Valley, and it is approximately thirty (30) miles long, found within the rain-shadow of the Ngorongoro highlands. It was named after the word ‘oldupaai’ in the local Maasai language to mean ‘wild sisal plant’. According to fossil evidence discovered within the Olduvai Gorge, it is supposed that a variety of hominid species were living within the crater constantly for the past three (3) million years of the Ngorongoro’s existence. The initial inhabitant who were hunters and gatherers that lived in this area were replaced by today’s pastoralists. The park can be accessed by either road transport as well as air transport. You can fly to Kilimanjaro International Airport found at Moshi, on the foot of Mountain Kilimanjaro. From there you may take a charter flight or transfer by road as the distance from Moshi to Arusha is just 55 kilometers. When driving, the distance from Arusha town to Lodoare Entrance Gate is 160 kilometers taking approximately two (2) hours along a tarmac road. Since the wild animals remain within the crater all through the year, the park can be visited all any time of the year stays in the crater all year round, there is really no good or bad time to visit. However given that the crater floor does get busy with vehicles, it can be more pleasant to visit during low season. Higher water levels in Lake Magadi (in the center of the Crater) also result in higher concentrations of flamingoes. Whenever you travel to Ngorongoro, you will be guaranteed excellent game viewing.